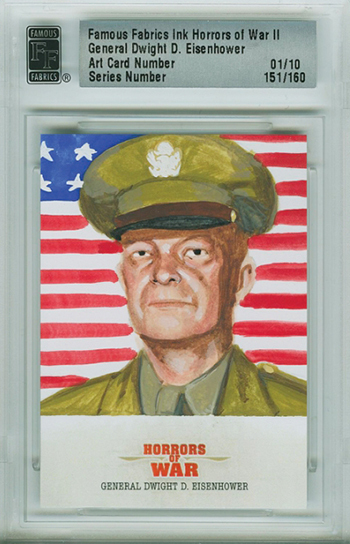 When it comes to trading card brands, Horrors of War is one of the most notorious of all-time. Originally released in 1938, they included graphic depictions of a world in strife. Controversial to some, they have become some of the most collectible cards in the hobby. 2013 Famous Fabrics Ink Horrors of War II is the company's second high-end release that re-imagines the brand as something more modern. Every box includes just three cards: a rare base card, a one-of-one cut signature autograph and an insert or buyback. 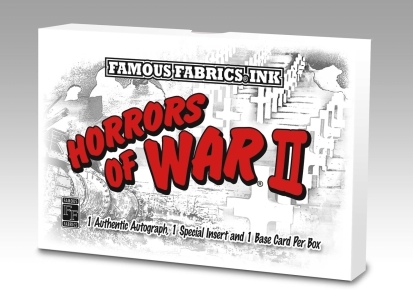 The 2013 Famous Fabrics Ink Horrors of War II base set has 40 cards. Numbering continues on from the company's first set. Base cards go back as far as the Seven Years' War of the mid-1700s all the way up until modern times with the London bombings. Cut signature cards are all one-of-a-kind. 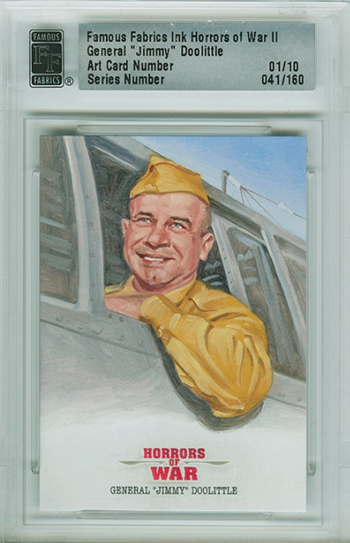 Autographs span generations, capturing lots of military heroes as well as some of history's most notorious names. Besides the base card and autograph, every 2013 Famous Fabrics Ink Horrors of War II box has a premium insert or buyback. Hand-painted Art Cards are the evolution of the sketch card. Sixteen different personalities are included in the set. And while every card has ten copies, all are original works of art. Subjects include Winston Churchill, Napoleon Bonaparte and Dwight Eisenhower. Not shying away from controversy are Art Cards of Adolf Hitler, Osama Bin Laden and Joseph Stalin, among others. 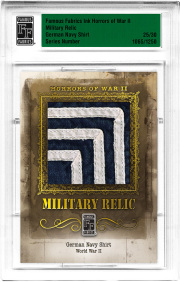 Military Relic and Military Patch cards have pieces of uniforms and military memorabilia embedded in them. Finally, 1938 Gum Inc. Horrors of War buybacks are original cards that have been professionally graded. HORRORS OF WAR WWII 115 card starter set Lot, Gum INC World war II 30 PICTURES! 2013 FAMOUS FABRICS HORRORS OF WAR II BATTLE OF THE SOMME BASE CARD 37 40! 2013 FAMOUS FABRICS HORRORS OF WAR II CODE TALKERS BASE CARD 37 40! SLABBED! 2013 FAMOUS FABRICS HORRORS OF WAR II PASSCHENDAELE BASE CARD 37 40! SLABBED! 2013 FAMOUS FABRICS HORRORS OF WAR II SINKING OF THE BISMARCK BASE CARD 37 40! 2013 FAMOUS FABRICS HORRORS OF WAR II THE BURNING OF ATLANTA BASE CARD 37 40! 2013 FAMOUS FABRICS HORRORS OF WAR II BATTLE OF LUNDY'S LANE BASE CARD 37 40! Checklist is not yet complete for all inserts. 40 cards. Numbering continues from where first series left off. 16 cards. Each card has 10 hand-painted versions.